OUR SHOP HOLDS THREE NATIONWIDE NUMBER ONE COLOR TITLES! WE COMBINE XTRA & PREMIUM TO CREATE A 3 STAGE APPLICATION GIVING YOU THE TOUGHEST COLOR LINER AVAILABLE ON THE MARKET. THIS IS NOT WHERE WE STOP! SUBSTITUTE LINE-X XS650 AS OUR BASE AND THE PERFORMANCE IS FULL THICKNESS UV THAT WILL NEVER DISCOLOR NO MATTER HOW HARD YOU ABUSE IT! 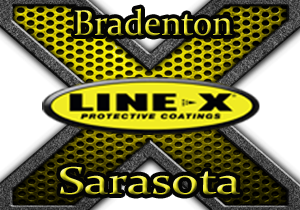 LINE-X XTRA can be color coded to your truck for the closest possible match—or sprayed in any color of your choice. Take a look at the Truck Gallery for a few ideas for your truck.